A Florida couple has been deprived of their newborn daughter based on a questionable court order—but the legal system isn’t sure how to respond. Justin Johnson, 36, and Rebecca Sanders, 28, became parents on the morning of Friday, March 17. The baby was delivered via Caesarian section at Baptist Hospital in Kendall, Florida. Two-day-old Ingrid Ronan Johnson was healthy and happy, lying in her mother’s arms, on Sunday, March 18, when a doctor came in and took the newborn girl for what her mother assumed was a normal checkup. Instead, the doctor handed the baby to two policemen, who said, “Your baby is being taken. She is no longer in your custody. You are not the mother anymore,” Sanders told the Miami Herald. The police officers were from the Miccosukee Indian reservation, where Sanders was a tribal member and where she had been staying with her mother, Betty Osceola. The tribal police had an order signed by a Miccosukee judge—but that judge’s order should not have had jurisdiction outside the grounds of the reservation. And the child, Ingrid Roman, does not have enough Miccosukee blood to be a tribal member. Yet now, nearly a week later, Johnson and Sanders are still separated from their baby, and no one is saying where that child is. Baptist Hospital released a statement on March 21. It is not clear that Miami-Dade police were involved with seizing the baby. According to the Miami Herald, Miccosukee tribal police were the only law officers present, and they took the child from her mother. Johnson and Sanders have filed complaints in every venue they can find, including with Miami-Dade Police and the U.S. Bureau of Indian Affairs. They have hired a lawyer to try to get their child back. But no one will admit to knowing where the child is or who might be caring for it. Miami-Dade Police Director Juan Perez said he would launch an “immediate inquiry” into the matter. “Once we have additional information, we can determine what, if any, additional steps are necessary,” he said. So far, no answers have been forthcoming. Johnson, 36, was a strength coach when he met Sanders, 28, a former bodybuilder. They met while Johnson was helping Sanders rehabilitate a broken arm. The pair moved to Arkansas together, and Sanders got pregnant. They returned to Miami recently so Sanders could care for an ill stepfather. They lived on the reservation with Sanders’s 11-year-old son and 12-year-old daughter, offspring from an earlier relationship. Once in Miami, the couple had to cope with Betty Osceola, Sanders’s mother, who seemed to dislike Johnson intensely. Johnson and Sanders told the Herald that Osceola couldn’t tolerate seeing her daughter with a non-Indian. Osceola got Johnson thrown off the reservation, and facing the extreme pressure, the couple decided to separate—but decided to stay close enough to co-parent. Johnson moved off the reservation; Sanders remained. Osceola drove her daughter to the hospital on the morning on March 17. Sanders insisted that Johnson be there for the birth despite her mother’s objections, and averred that Johnson would always be part of the baby’s life. Betty Osceola responded with anger. “She threatened to take my kids away. She didn’t want him there. She told security he needs to be removed,” Sanders told the Herald. The next day, hospital security did indeed remove Johnson from the room, “They had received phone calls that it would be in their best interest to have me removed,” Johnson explained—but the hospital staff would not say who had called. The next day, tribal police came and took the baby. In the complaint Betty Osceola filed with the Miccosukee tribal judge, the child’s grandmother claimed that both Johnson and Sanders had struck Sander’s 11-year-old son, who is autistic. Both deny the claim, and the court order signed by the judge did not accuse either parent of wrongdoing. Based on that one complaint, the judge signed a court order allowing the child to be seized. The Herald contacted former Miccosukee Police Chief Dave Ward. Though Ward is not involved with this case, he knows tribal law. Ward told the Herald that tribal court orders are not valid outside the reservation. 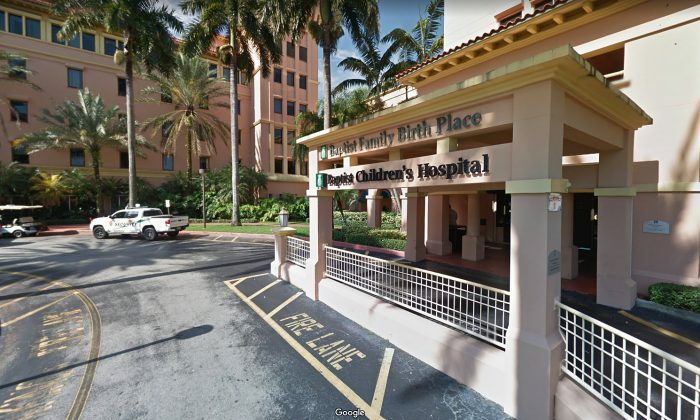 “In my opinion, the Miccosukee officers needed to present the tribal order to a state or federal judge in Dade, who would review it and issue an order allowing Miami-Dade police to follow through with removing the baby,” he stated. The problem here is that while this seems to be a straightforward custody issue, there are complicated politics involved. The Miccosukee reservation is essentially a foreign nation within the confines of the United States. Custody battles are actually matters of international relations. If the child was on the reservation, only federal law enforcement officials could go after it. The Miami-Dade Police Department has no jurisdiction on Indian lands. Everyone is proceeding cautiously—despite the fact that the health and safety of a newborn child could be at stake. The matter should be simple enough to rectify once it finally gets into a court of law. In 2014, the Herald reported, Florida’s Supreme Court ruled that the Miccosukee court had no jurisdiction in a custody dispute between a mother, who was a tribal member, and the father who was not. A State court ruled that Miccosukee justice system, which did not allow the father to testify or the father’s lawyer to attend, did not meet minimum legal standards. The Florida Supreme Court agreed. The problem is, it could take unknown amounts of time—months, possibly years—for this case to wend its way through the legal system. And through all that time a child is being denied the love of its parents. Justin Johnson and Rebecca Saunders are outraged and frustrated—but most of all, heartbroken. Johnson recalled the last time he saw his daughter. “I remember kissing her forehead and telling her, ‘Daddy will see you soon,’ ” Johnson said, fighting tears. The U.S. EPA has given Florida specific measures to restore water quality to protect the Everglades. New Jersey man celebrates the legal decision to return his 9 year-old son to the U.S.